Luckily I don't have a nine o'clock lesson on Mondays which means I have a bit of freedom in the morning, and more often than not I get a bit of extra sleep, do some yoga and spend the rest of the morning getting ready at a more than leisurely pace. However this morning I didn't really feel like doing any exercise so instead I woke up, spent 20 minutes in bed, showered and whipped up a huge, creamy cinnamon banana smoothie (4 frozen bananas, a heap of cinnamon and some rice milk). After gulping down my smoothie I got ready (very) slowly before leaving the house at about ten o'clock to catch the bus to college. I've been feeling a bit under the weather lately so before I left I decided to throw my copy of Eckhart Tolle's 'The Power of Now' in my bag, a book I started reading towards the end of last year which I put down over the Christmas period and haven't really picked up since, until today. 'The Power of Now' focuses on explaining why being preoccupied with worries and anxieties about the future and hanging onto the past is the real cause of our suffering, and Tolle uses this book to teach us how to be present in 'the Now' and open our eyes to the liberation that comes from focusing solely on the present moment. This book is similar to one I read over the summer, 'The Art of Happiness', which puts the teachings of the Dalai Lama into ideas and guidelines that can be applied to every day life, and again the focus is on shifting your thoughts in a way that stops you creating or over-emphasising suffering. 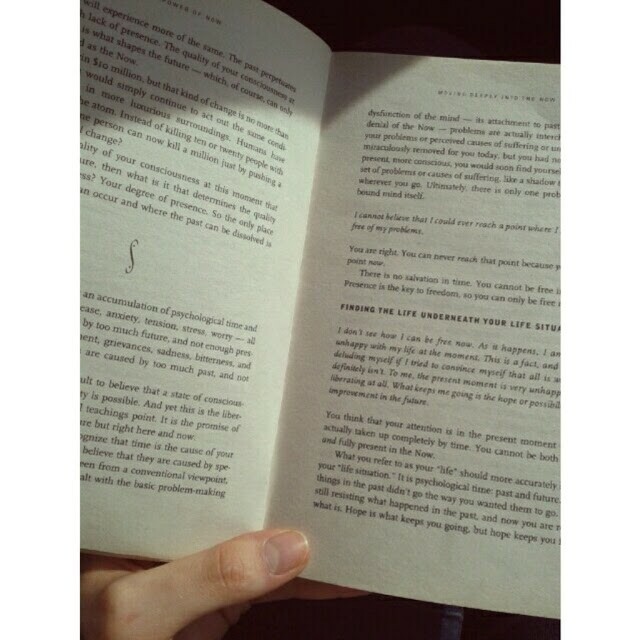 I spent my bus journey reading Tolle's wise words and listening to Vance Joy and All The Luck In The World, and while I may have only read a few pages, the words really got through to me and reminded me of how to just be here and now rather than worrying about past and future events - this doesn't mean forgetting the past or ignoring the future, however, but rather giving your attention to what is happening now. 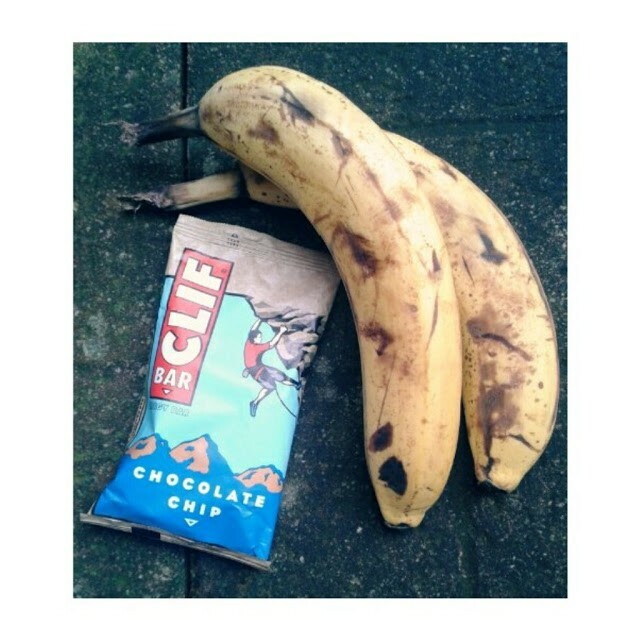 I also packed myself some tasty food to fuel me through the day in the form of two perfectly ripe bananas and a chocolate chip Clif bar. I'd seen Clif bars on Instagram so many times but I'd never been able to try one since I'd never seen them in the shops before, so I was delighted when I popped into Boots the other week and saw that they were selling both the peanut butter and chocolate chip varieties. I bought a peanut butter one at the time and loved it so I thought I'd give the chocolate a go too and while it was still yummy and filling, I found that it was more oat-y and flapjack-y while the peanut version was much more fudgey and gooey. Things like Clif bars and Bounce balls (the coconut macadamia flavour is to die for) are so handy when you need energy on the go and I'm always sure to keep my kitchen stocked up with a few for those days when I'm running out the door and I just need to grab something quick to something to keep me going. Tuesday got off to a beautiful start when I got ready surprisingly quickly and was able to leave the house earlier to catch an earlier bus to college (which is always nice because the earlier one is much quieter and it gets me to college early enough to grab a coffee before lesson). 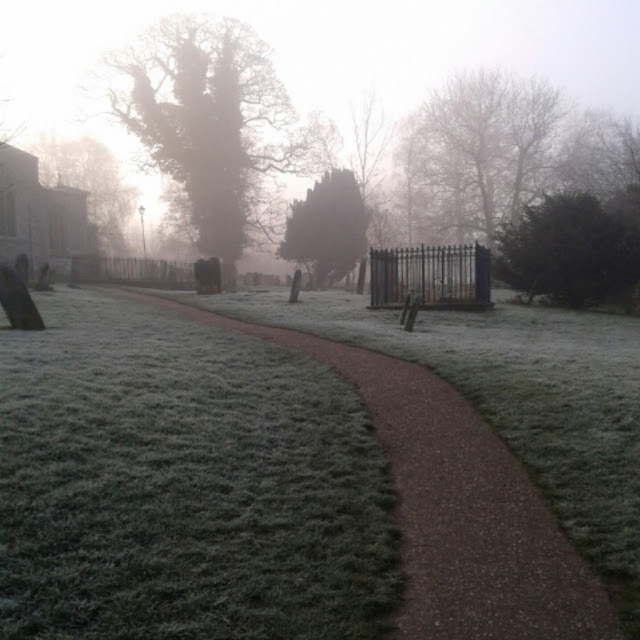 My already good mood was made even better when I stepped out of the front door to see how frosty and misty it was outside, and I couldn't help but snap this picture on my way to the bus stop. Mornings like this are my favourite kind of morning because everything just looks so delicate and pretty when its dusted with frost, and the morning light shining through the mist looks so dreamy. It was a little chillier than it had been for the past few days and I was glad to be wearing my parka, so when I got to college I picked up a soy chai latte to warm myself up. I hadn't had one for over two years so I'd forgotten what they tasted like and it was sweeter than I remember, but the honey flavour reminded me of drinking warm milk and honey before bed when I was younger, so as well as warming me up it took me on a bit of a trip down memory lane. Skip forward a few days to Friday and we end up here. I knew this weekend was going to be chock-a-block with coursework and revision so I went into college early that morning to get some work done so that I could take the evening off. To start off my relaxing evening I made myself a big glass of iced peppermint tea which was I was inspired to make after a friend told me about it in psychology. 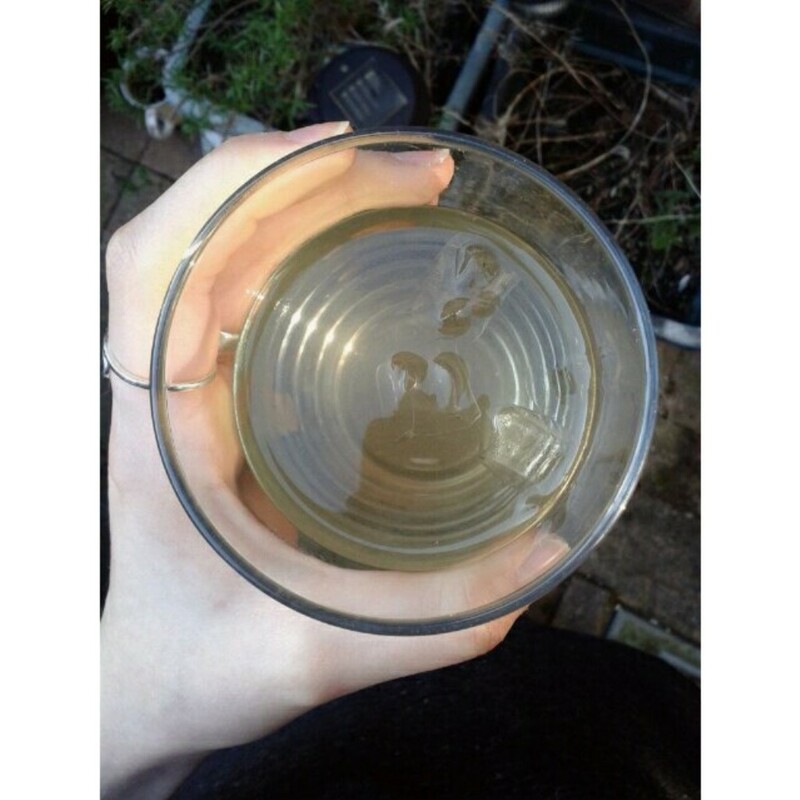 I usually drink herbal tea quite weak as I find they can be bitter if they're left to brew for too long, and although this could have done with being a little stronger, it was still so light and refreshing. 1. Boil some water (you won't need much) and fill your glass about 1/4 of the way up. 3. Here you can either remove the teabag if you don't like your tea as strong, or you can leave it in depending on your tastes. Top your glass up with cold water until you have as much tea as you'd like. 4. Now you can adjust your drink to make it perfect for you - you can add ice, lemon, honey or agave, sugar/sweetener, strawberry slices etc. 5. Now sit back, take some time out for yourself and enjoy. If you've never tried this before I would definitely recommend it, particularly if you're a tea lover but you don't fancy drinking anything hot in the warmer months. And if you're not a tea lover, you could always make this with coffee, too. Just follow the same steps, but rather than brewing a teabag make up a small amount of coffee (allowing one spoonful of coffee for each cupful of water) and then follow the rest of the recipe. You can play around with the flavours with this option too by adding in milk or flavoured syrups, or even by using flavoured coffee. It's safe to say I'll be making plenty of iced drinks like this over the summer! Friday was just a normal day and I didn't do anything worth photographing, so my final photo for this week was taken on Saturday afternoon. I had a real craving for chai tea, although the closest thing we had in the house was the Yogi Tea 'Choco Aztec Spice' so I had to settle for that. I used to love this tea a lot but I kind of went off it for a little while, and I think my craving was sparked after watching 'Wanderlust' the night before - a film which tells the story of a couple (played by Paul Rudd and Jennifer Aniston, two of my favourite actors) in Manhattan who end up moving into a a commune in Georgia when both of their careers go down the pan. Wanderlust makes for really easy, light-hearted watching and if you're anything like me you'll end up wanting to go and live in a commune yourself. Back to the tea. 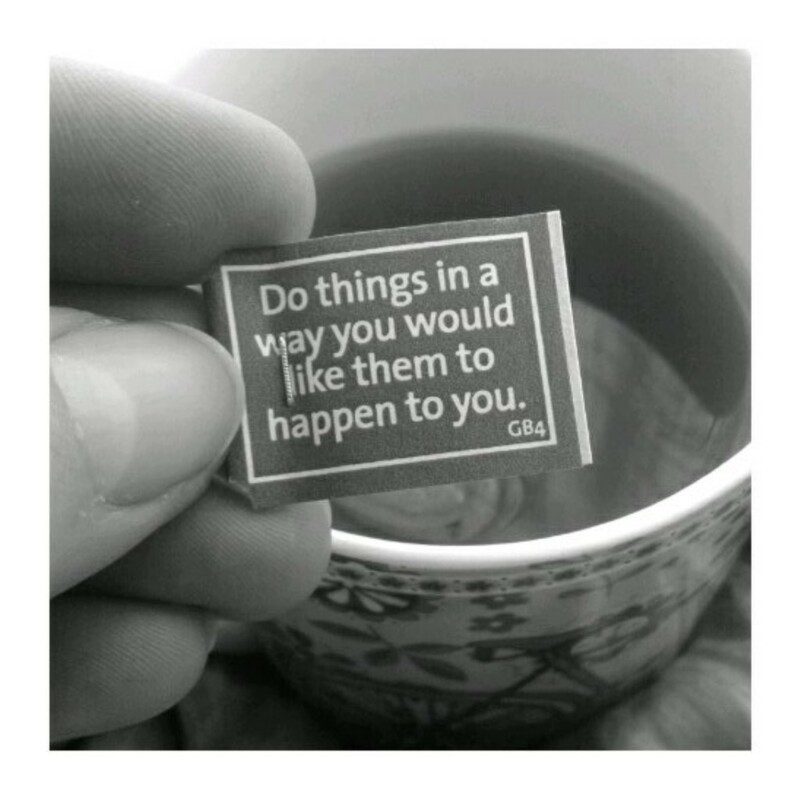 One of my favourite things about Yogi Tea is the individual messages that come with each teabag, and Saturday's message was: "Do things in a way you would like them to happen to you". At first I wasn't quite sure what this meant and I could only think of treating others as you wish to be treated, but after some thought I figured that this could mean exactly what it says: do things in the way you want them to happen. So, for example, if you want your week to start on a good note tomorrow and you want to wake up early, perhaps go for a run or do some yoga, jump in the shower and then make yourself a delicious breakfast, then do it. Or if you want to take on your work, be it your job or college/uni work, in a calm manner, and you want to be organised with it and allow yourself some time out too, then do it. If you have a picture in your mind of how you want something to be or how you want to act, things can be that way. You just have to take steps towards making those things happen and more often than not there's no reason why things can't be the way you picture them. This message really spoke to me so from now on I am going to make a conscious effort to take steps towards making each day pan out the way I'd like it to. Of course plans change and sometimes we have to change our priorities, but as part of 'doing things in a way I'd like them to happen to me' I'm going to try and take these changes in my stride and embrace the ever-changing and ever-flowing energy that is life. And of course, I will also treat others as I would want to be treated, holding doors for strangers, smiling at people in the street and wishing the person behind the counter or the person who makes my coffee a good day. I hope you've had a lovely week and you've been able to enjoy the lovely spring weather we've been having this week.